While the wedding planning frenzy starts to unfold in your household with mum busying herself with arranging your bridal attire and sourcing the never-ending list of things to pack away in your trousseau, and dad figuring out the venue, the caterer, guest lists and of course endless visits to the bank - you will be going through an emotional roller coaster - one that you will ride with the fiance and other you'll be on with your mum and dad. While mum will tear up at every mention of your favorite food or your milestones as a toddler, Dad will be your strongest support, giving you the warmest hug every now and then for no reason at all. These hugs will mean more than what words can express. A father is the first man a daughter deeply admires and eventually falls in love with. He is her knight in shining armour, when difficulty dawns on her and her guide to how a man should treat her right. It's a no-brainer then that your wedding is a major milestone for him and you together. The beginning of a new, more independant journey with a family you are going to create from scratch. Involve your dad in the preparation of this journey you are about to embark upon. From A father daugter date, to a trip with you for your final bridal fitting, from letting him sneak a look when you are transforming into a bride, to taking him jewellery shopping, from writing a speech for him to planning an exclusive sangeet performance where both of you let your hair down - we have endless ideas you can use to involve dad that'll make for super special memories that'll last a lifetime. Who said Dad's role in the wedding is just footing the bills. We share some really sweet, cute and fun ways you can involve your daddy dearest into the whole wedding hullaballoo. Here goes! Ladka karta kya hai? Does he have a good job? Kitna kamata hai? Kaha tak pada-likha hai? Were these endless questions thrown at you when you introduced your fiance to your dad? Whether you found the love of your life or mum and dad were instrumental introducing you to your future husband, rest assured dad has left no stone unturned to find out everything about the man he is giving you away to, without you catching a whiff. Use Dad's research skills to help you in the wedding planning process. Let him research the best wedding venues and vendors. Trust us on this - he is the one man who will make sure every little detail on your special day is exactly like how you want it to be. Tap Into His Interests and Expose His Talents! You may not even know the hidden talents Dad is eqipped with. And what a wonderful time to find out, right? He could be your stylist, your catering advisor, a great planner or even a shopping aid. Explore his many talents and take him along whereever possible. Include some daddy-baby fun while doing it. Go lehenga shopping and stop at his favorite chaat wala for a quick bite, go venue scouting and linger on for a drink. These are things that stories and memories are made of. Shake a leg with your old man and bring out the child in him. You can either choose to perform on a fun and peppy number or just a simple classy waltz on a song you both love. Throw this idea at him and we’re sure he might have a song in mind to share a special moment with you. Father-daughter dances are part of weddings in the west. 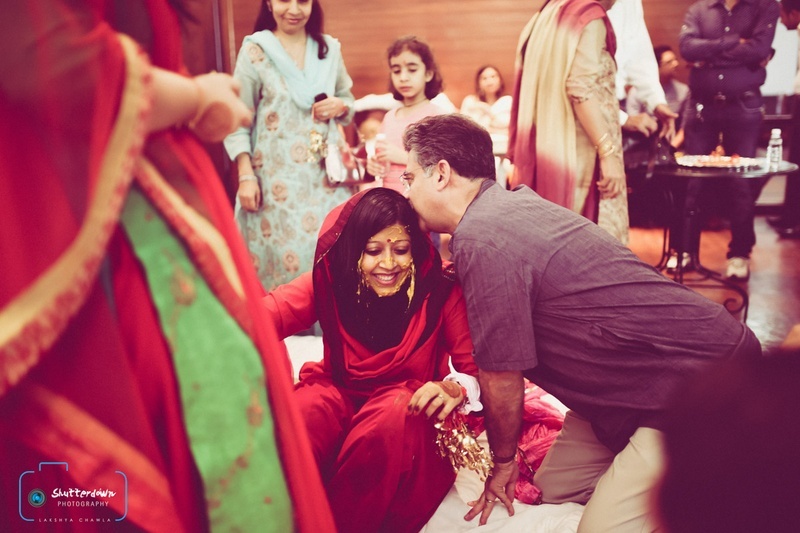 We think this is one ritual we could borrow to lighten up the oh-so-serious atmosphere at our Indian weddings. Dad is the best man to create and manage your wedding checklist. You know he will not falter when it comes to even the smallest line items on it. He will be dependable, detail oriented and committed to the talk of getting things done. Use his project management skills to stay on tasks, timelines and budgets. There are chances dad will drink himself silly or dance in the most antrangi style ever, but lose the fear of 'the parent embarrassing you' today. It doesn't matter. Today, he deserve to be himself and have a moment. After all, it’s his little doll's big day! Give him a special gift by arranging a Father-Daughter First Look with your photographer. This is where your daddy dearest will be the first person to see his baby girl all dolled up ready for the new road ahead. You’re sure to treasure these moments for a lifetime.